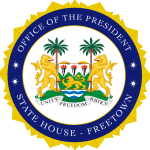 Professor David J. Francis serves as the Chief Minister of the Republic of Sierra Leone. Before his appointment, he was Chairman of the Government Transition Team. He was accredited by His Excellency President Bio as the Minister of Foreign Affairs and International Corporation for the purposes of the Common-Wealth heads of Government Meeting (CHOGM) / Commonwealth summit in London from 18 to 20th April 2018 and the state visit to the State of Qatar from 21st to the 23rd April 2018. Professor David J. Francis was the Head of Department of Peace Studies & Director of the John & Elnora Ferguson Centre for African Studies (JEFCAS) at the University of Bradford, UK. He currently serves as Commissioner for the UK Commonwealth Scholarship Commission and holds the UNESCO Chair of African Peace and Conflict Studies at the University of Bradford. He holds a PhD degree from the University of Southampton, United Kingdom; Diploma in Law, Development and Social Justice from the Institute of Social Studies, The Hague, The Netherlands; Diploma in Human Rights, Raoul Wallenberg Institute, Lund University, Sweden, and BA (Hons) from Fourah Bay College, University of Sierra Leone. Professor Francis has published extensively with nine books and more than fifty journal articles, book chapters and commissioned-policy papers. Some of his published works include: When War Ends in Africa: building peace in divided communities. Ashgate: May 2012 (edited); Policing in Africa. Palgrave /Macmillan, April 2012 (edited); National States and the Challenges of Regional Integration in West Africa. Paris: Karthala, December 2011 (ed.) (UNESCO – SHS MOST Project); US Strategy in Africa: AFRICOM, Terrorism and Security Challenges. Routledge, Feb. 2010 (Edited); Peace and Conflict in Africa (ed.) London: Zed Books, September 2008 (Translated into Arabic in May 2010 by the Egypt-based Arabic Translation Institute); Uniting Africa: Building Regional Security Systems, Aldershot: Ashgate January 2006; Civil Militias: Africa’s Intractable Security Menace? (ed.) Aldershot: Ashgate, 2005; Dangers of Co-deployment: UN Cooperative Peacekeeping in Africa. Aldershot: Ashgate, December 2004 (co-authored with Mohamed Faal, Alex Ramsbotham & John Kabia); and The Politics of Economic Regionalism: Sierra Leone in ECOWAS, Aldershot: Ashgate, December 2001. Professor Francis has facilitated the introduction and implementation of 16 undergraduate and postgraduate degree programmes (BA; MA and PhD) in Peace and Conflict Research and Peacebuilding and Conflict Resolution at African universities in 10 countries, including the establishment of four specialist peace and conflict management centres in Sierra Leone; Liberia, Ethiopia and Botswana. Professor Francis consults widely for key UN agencies; ECOWAS; African Union and some African governments.